Runoff here in western Montana was especially heavy and long lived this year. But Rock Creek, the Bitterroot and Blackfoot Rivers are all clear and fishing well. The Clark Fork is almost there. The upside to a long runoff season is that the late summer and fall fishing will be great. 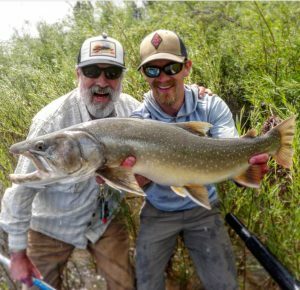 Blue Damsel Lodge Manager Emeritus Keith Radabaugh landed this giant Bull Trout yesterday while fishing the Blackfoot River with Blackfoot River Outfitters guide Evan Youngblood. Make plans now to visit soon. This entry was posted on Sunday, July 1st, 2018 at 2:38 pm and is filed under Uncategorized. You can follow any responses to this entry through the RSS 2.0 feed. Both comments and pings are currently closed.